This Dark Star large Art Deco design Tiffany table lamp is striking and beautiful, designed with iridescent black against pearly cream glass. Supplied with a dark antique base that is almost black and fitted with an inline cable switch. The large 49cm (20-inch) Tiffany shade has a pearly cream base colour and strong contrasting iridescent shades of black inset into a symbolic design that glisten like oil on water. A large table lamp suitable for any Art Deco or traditional environment, supplied with a dark antique base that is almost black, with a dark metallic sheen, hand crafted in the traditional manner using age-old soldering techniques. Strong bold lines and the use of bold colours were a firm favourite in the Art Deco Period. This lighting range creates an aura of Art Deco design. This is a hand-crafted Tiffany lamp and the shade colours may differ slightly from the image shown, as each piece of glass is hand-made and may differ slightly in colour or shade. This should not be seen as a fault, rather something that makes each Tiffany shade unique. 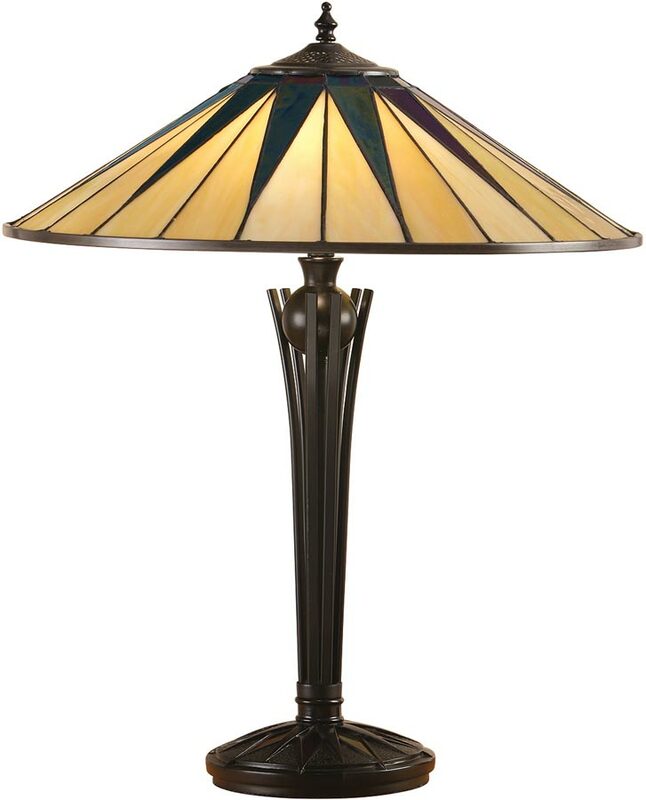 The Dark Star large Art Deco design Tiffany table lamp, designed and manufactured by Interiors 1900.